For a while, I have been working on my 'Moving Forward' series, which are paintings of crowds of people slowly walking forward. I got the idea for these paintings when I went to Dala, a small suburb across the river from Yangon. When I was getting onto the commuter ferry I felt very uncomfortable because I was in a big crowd and everyone was very close. Most of the people in the crowd were street vendors. They have to commute every day and they work hard for the little money they make. When I got to the other side everyone got off the ferry except for me. I stayed behind and I got to witness that crowd from afar. Sometimes a kid who was being carried would turn around and look back at the boat and the crowd of people. In those moments the single child’s face became very vivid. It was beautiful and it helped me escape from my earlier uncomfortable feelings. I could still see the crowd though -- the rhythm of daily life, the struggle and the beauty of it. So now I paint these Moving Forward pictures." Khin Zaw Latt says, “During my training at the University of Culture, I spent time learning about sculpture as well as painting. I liked looking at sculptures of the Buddha’s head, and I also liked to sculpt the Buddha myself. 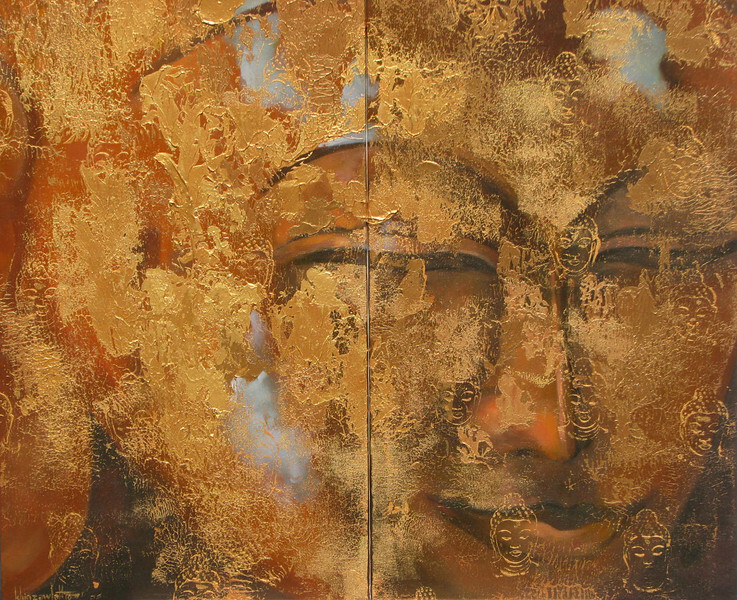 I was looking at an old statue of the Buddha one day, and I saw how the gilding had been partially worn away by time, and by a lot of touching, which gave me the idea to try to paint this effect on canvas. I experimented with making the background Buddha image more or less obscure, and with different arrangement of the floating patches of gold over top. To add texture, and also to depict the repeating nature of Buddhism with the reincarnation, I created the small stamp of the Buddha for the background."